How do you feel about grocery shopping? Is it the highlight of your day? The most dreaded part of the week? If you're struggling financially, an expensive grocery trip is disheartening. The good news is that healthy food doesn't have to cost a lot. In fact, many of the healthiest foods are actually the least expensive. For example, think of organic carrots. They're often sold for $1 per pound or less. They stay fresh for a long time in the vegetable drawer within your fridge, so they rarely "go bad." Some other organic foods sometimes cost as little as $1 per pound, but the weight of the food is only one way to measure it. The weight of the food tells us relatively little about how filling, satisfying or healthy the food will be. When I'm grocery shopping, I'm asking myself, "How can I spend my hard-earned money to get me the most nutrition for the least amount of money?" I also ask myself other questions, but lets answer one question at a time. So we know that one dollar will get you one pound of organic carrots, which is roughly six large carrots at 185 calories. That single dollar will provide 26% of your total nutritional needs for a day , including all the beta carotene your could possibly wish for, 14% of your day's requirement zinc, 12% of your day's requirement for calcium, 24% to 48% of each of the various b-vitamins, and so on. 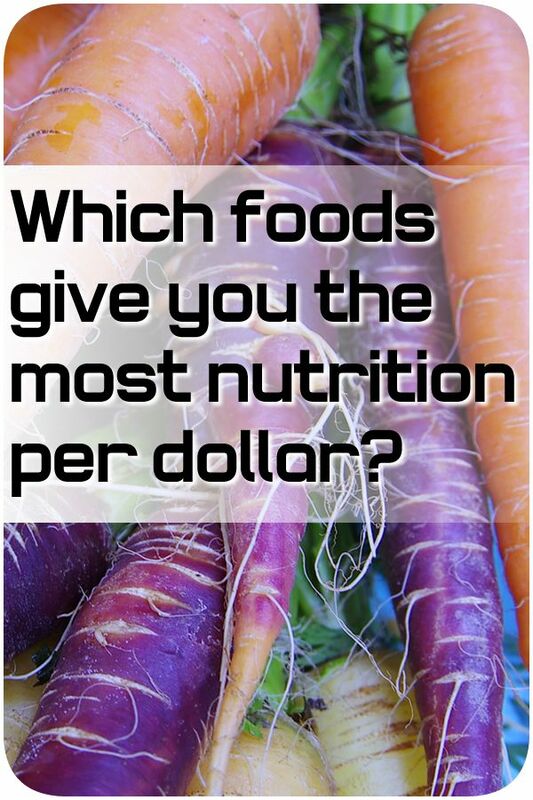 The bottom line is, one dollar spent on carrots is highly efficient in terms of the amount of nutrition received. Let's compare that to walnuts, the latest craze in health. One pound of organic raw walnuts would cost me $14. So a single dollar of walnuts gets me a fourteenth of a pound, which is 1.14 ounces (which is a little more than a quarter cup of walnuts). So how does a quarter cup of walnuts compare to six large carrots? The carrots provide 185 calories and 26% of your overall nutritional needs, especially in the areas of b-vitamins and minerals. The walnuts provide 211 calories and 22% of your overall nutritional needs for a day, most of which is covering your need for fat, manganese, and omega fatty acids (which it provides in a poor ratio – with more than four times as much omega 6 as omega 3). There is more to the story. The nutrition in the walnuts is difficult to digest. In order to really benefit from the amino acids locked away in the walnuts, the walnuts will need to be soaked over night and rinsed thoroughly to remove the enzyme inhibitors. Worse, most walnuts sold at the store are kept there for a long time before they sell. Oxidization occurs over time, causing the nuts to lose nutrition. To top it off, often the walnuts get moldy before they're dried. The mold produces toxins (as a way of fighting off competing molds and bacteria) which are harmful to our health. So here is the scoop on walnuts: Yes, they're a great source of healthy fats when they're fresh, but rarely can you buy fresh walnuts from the grocery store. If they're purchased in the shell and you crack them yourself, you might get excellent quality walnuts. At best, the carrots offer more nutrition per calories and per price. At worst, the walnuts are not only inefficient at providing nutrition – they may also be laden with mold waste. And you have to soak and rinse them to be able to digest them effectively. In other words, the carrots are a better deal. I'm not saying you should never eat nuts, or that nuts have nothing to offer. But when it comes to grocery shopping, I like to leave the store knowing I got a good deal on the amount of nutrition I purchased, so carrots are one of the items on my shopping list. Surprising fact: Carrots actually do provide some fat, it's just a very tiny amount. In a pound of carrots you'll find a gram of fat. In one head of lettuce, you'll find two grams of fat. To learn more about affordable nutrient-packed foods, visit my page on eating an organic healthy diet on a budget and sign up for my newsletter below.